EXPLORE OUR STATE-OF-THE-ART ENGINEERING TEACHING EQUIPMENT! the science & engineering products in the UK and Ireland. This includes the best of all three brands of the LD Group: FEEDBACK, LEYBOLD & ELWE. 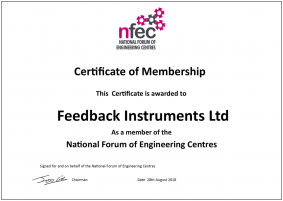 FEEDBACK INSTRUMENTS LIMITED IS A MEMBER OF THE NFEC. The UK based National Forum of Engineering Centres is supporting Centres that provide education and training in engineering and the related technologies, whether they be colleges, private training providers, industry-based training centres or university technocal colleges.